A little more than six years ago I wrote my first guest blog post here on Scott’s website, and it’s incredible to see both how much has changed, and also how much has stayed the same. Since my last post here I got married, moved five times, adopted two dogs, traveled to eight new countries, checked off a few items on my bucket list, and I’ve also grown my photography education business into a full-time job. While my life looks a little different than it did in 2012, my excitement and passion to grow as a photographer is the same. One of the things I love best about my job as a photographer is that I get to call all of the shots. I have gone in a solo direction with my work and get to photograph what I want and make books and tutorials that are of my own creation. It’s fulfilling, but it also takes a lot of self-determination and a good work ethic, and I’m constantly forced to stay at my own very high level of expectations. Here I’d like to share some of the things I’ve learned during my time as a photographer. This is a selection of some of the images I created while in high school. I quickly fell in love with photography but worried I would fall out of love with it if I made it my full-time job. When I was in high school, I can remember wanting to be a sports photographer. I had just taken my first class in photography and joined the yearbook committee as a staff photographer. I found my “thing” and knew that photography was something I wanted to do long term. Then, when I joined the military, I chose a path other than photography. I was worried if photography was my full-time job that I would fall out of love with it. I began my career in photography by creating and licensing photos for stock photography, just like this image of a utility lineman working on a power line. Now, a few decades later, I realize that I had nothing to worry about. Because of the Internet and digital photography, I was able to find a way to make photography my career. 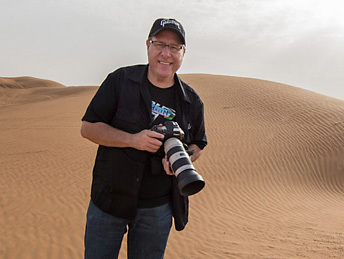 A path that began as with stock photography has evolved into a career in photography education. I wasn’t following someone else’s path or anything out of a book. I discovered the way on my own. Each year in Canby, Oregon, the dahlia fields bloom, and with it come the bees, which are very photogenic. I have a lot of fun chasing and photographing both the bees and the flowers. Whether or not you make photography a business, you’ll likely still go down a certain path with your work. Maybe you enjoy landscapes, architecture, portraits, or flowers. Whatever it is, make sure it’s something you enjoy, and don’t be afraid to experiment with new types of photography that may be vastly different than your current photographic interests. I’m lucky to live in the Pacific Northwest, one of the most beautiful parts of the country. And I’ve fallen in love with landscape photography because of it. Should you stick to one genre? Maybe. It depends on your goals and what you want to achieve as a photographer. This is a very personal decision and is entirely up to you. Personally, I enjoy photographing almost everything. Many people know me for my food photography, but I also do a lot of landscape, nature, and travel, as well as macro and water-drop photography. I’ve even done some underwater photography as well. And thankfully, with the job I chose, having a diverse set of photographic interests can be beneficial. With a wide genre of photographs in my portfolio I am able to write books and create video training that appeals to a larger audience. And I also love the challenge of learning something new, and sometimes that involves going down a creative path that is completely different from the photography I’ve made in the past. Sometimes I like to challenge myself to create something that is outside of what I normally would photograph, such as this black-and-white street image in Venice, Italy. You will probably hear a lot of strong opinions on whether or not you should stick to one niche, along with many other topics relating to photography and business. Maybe they come from an anonymous voice in an online comment, or from a trusted photographer friend. I know I’ve heard my fair share of opinions from photographers who think they know what is best for me and my business. But in the end only you know what’s best for you and your photography. Listen to your gut and don’t let someone else steer you in the wrong direction. With social media so prevalent in our digital lives it’s sometimes difficult to keep up. Staying fully engaged on social media can be a full-time job, and very few are able to have a team of people working this job for us. Personally, I’m pretty awful at keeping up with it, so now I’m doing my best to determine which of the current platforms to spend more of my time and energy on. I also have my own social network, so to speak. One of the best forms of communication I have is my newsletter. While social media is good for sharing photos and other information, so much of it gets swept away only moments after it is posted. With email, however, my messages are going directly into the inboxes of my subscribers. It’s understood that each message I send is about me and my work, which is why people signed up in the first place. And while I offer a lot of free downloads and tutorials to my subscribers, I don’t hesitate to ask for a purchase. In fact, I make nearly all of my income from what I offer my members through the newsletter. It’s my most personal—and profitable—form of communication. It also allows someone to get directly in touch with me, just by replying to one of my emails! That gives me the chance to chat one-on-one with someone, and their message doesn’t end up getting buried by the endless flood of social media streams. Many of the photographic skills I have are from trying to learn and master something new. In fact, I quite enjoy the challenge of seeing whether or not I could really learn how to photograph something on my own, only using books and the Internet as my guide. And I’ve discovered some very enjoyable genres of photography that I will continue to pursue into the foreseeable future. I taught myself food photography and eventually went on to write two books and one video course. This image of blueberry French toast was created in my KelbyOne course — Food Photography: A Recipe for Savory Success. Food photography is one example. In my early stock photography days, I decided to give it a try, even though I knew nothing about how to properly photograph food. My initial images were awful, but as time progressed and I learned more about lighting and food styling, my images improved. Eventually I would write two books on food photography—Food Photography: From Snapshots to Great Shots—as well as a video course on the KelbyOne website. I thought it would be fun to see if I could create some legitimate water drop photos, and I was right! This is now one of my favorite types of photography. Another good example is with waterdrop photography. In fact, I came across this just by random interest. There is a device I was purchasing—the Pluto Trigger—to use for photographing lightning, and while researching it I saw that they also sell a water drop valve as an accessory. The valve was not too expensive, and I thought it might be fun to try my hand at photographing water drops. After getting the valve and doing some research online, I was able to create some beautiful photos on my first try! It’s now become one of my favorite things to photograph. Whether or not your goal is to become the best photographer you can be, we tend to enjoy something more when we’re good at it. The best way to become good at something is to practice as much as possible. Not only will you help create muscle memory with your camera, you will solidify your technical knowledge about your gear, settings, and even your surroundings and subject matter. And this also applies to processing your photos and using software. I’ve been an avid Photoshop user for a very long time, but even those skills can get rusty! I make sure to create my own personal projects on the side to keep my “Photoshop muscles” fit. I love experimenting and playing around in Photoshop, which is how I created these double-exposure images. Even I have had my moments where my camera sat around collecting dust for a little too long, and I remember feeling rusty when I finally picked it up again. If you enjoy photographing landscapes but live somewhere that is lacking in natural beauty, maybe you can experiment with a different type of photography that is not dependent on the environment. Or maybe you could sign up for a 365 challenge, where you create a new photograph each day for an entire year. I attempted this one (and didn’t make it all the way), but it did encourage me to create a handful of good photos that otherwise would not have been created. There are a lot of other opportunities to encourage you to pick up the camera. If you’re on Flickr, you may find groups that motivate you to get out and use your camera. I even have my own “Nicolesy” group where I run monthly photo challenges (click here to check it out on Flickr). Or maybe you’ve joined a local photo club, a photowalk, or an online forum. Find something that works for you and inspires you to get out and create something. One of the most thrilling experiences I’ve had was cage diving and photographing great white sharks. It’s an opportunity I may not have had if I were not excited about photography. Whatever route you end up following, if photography is important to you, the best thing you can do for yourself is to create. While photography is my main focus, I am a fan of creating so many other things and have quite a few hobbies. I love to knit, I’m a big pottery enthusiast, and I also enjoy the process of working on my website and creating books and video training for my business. When I’m creating, I’m happy. You can see more of Nicole’s work and tutorials on her website, YouTube channel, and Flickr profile, and keep up with her on Instagram, Twitter, and Facebook.